Members of the National League for Democracy said Monday that they would not register to vote after they met in Yangon, Myanmar’s main city. BANGKOK — After months of internal debate, members of the party of Daw Aung San Suu Kyi, the long-detained pro-democracy leader, defied Myanmar’s junta by announcing Monday that they would boycott the country’s first elections in two decades. The move raises questions about both the future of the Burmese opposition and the credibility of the vote. According to election laws the junta released earlier this month, the decision means that the party that has served as the mainstay of the country’s democratic movement for two decades, the National League for Democracy, will be automatically dissolved. Western governments, including the United States and Britain, had said that Mrs. Aung San Suu Kyi’s participation and that of her party were prerequisites for legitimate elections. On Monday, U Win Tin, a founding member and strategist for the party, said that more than 100 delegates were unanimous in their decision. “We will ask the people around us not to vote in the election: Please boycott,” he said in a telephone interview. He said that the party would try to continue political activities after it is disbanded. “We will work for the people,” he said. The party had been split over whether to participate in the elections, forced to choose between participation that would undercut its principles and a boycott that would dissolve it. Last week, Mrs. Aung San Suu Kyi said through a spokesman that she viewed the election process as “unjust” and that she felt that the party should not take part. Mr. Win Min said the National League for Democracy would likely be disbanded by May 6, a deadline set in the election laws. The party’s assets, including offices, might be seized. “Some members may be planning to set up a new party,” Mr. Win Min said. The ruling generals portray the vote as part of a “roadmap” to democracy after 48 years of military rule, while diplomats and exile groups view it as window-dressing for the junta’s continued hold on power. But some inside Myanmar say they believe the elections offer at least a modest positive step. In recent months the military government has announced nascent liberalization measures that they see as possibly the beginning of a decentralization of power. The measures include issuing permits for private hospitals and schools and allowing private-sector management of the rice industry. But the counterpoint to these economic measures is the consistently hard line that the military has taken with the political force it considers its archenemy, Mrs. Aung San Suu Kyi, 64, and her followers. Her party won a landslide victory in 1990, a result that was ignored by the ruling generals and officially nullified just this month. The party has been weakened by two decades of harassment, intimidation and imprisonment of many of its members, including Mrs. Aung San Suu Kyi and Mr. Win Tin. The party’s leaders are aging — Mr. Win Tin is 81 — and the membership has dwindled. Among many restrictive measures in the election law, criminal convictions bar candidacy. This includes Mrs. Aung San Suu Kyi and Mr. Win Tin among the estimated 2,100 political prisoners in the country, many of whom were leaders of protest movements in 1988 and 2007 and form the core of the country’s democracy movement. Taking part in a new election would also have been a signal to people in Myanmar that the National League for Democracy had agreed to forgo its 1990 victory, Mr. Win Tin said. “We would have to give up all of our political convictions,” he said. The party also wanted to send a signal to armed ethnic groups in the northern reaches of the country that the election was illegitimate. The junta is demanding that the ethnic groups disarm. “A sort of civil war will flare up very soon,” Mr. Win Tin predicted. Mr. Win Tin, who wrote poetry during his nearly two decades in prison, used a concoction of water and red dust from the bricks of his cell to write his verses. He was denied pen and paper in the infamously brutal prison system. Today, he said he is followed by military intelligence whenever he leaves the house. Agents were outside on motorcycle as he spoke to this reporter, he said. “For me it’s as if I were still in prison,” he said. “I feel like the whole country is imprisoned,” he said. The U.S. State Department on Monday blamed Burma’s military government for the opposition’s decision to boycott upcoming elections. The United States called the situation in Burma “disappointing,” but added that Washington will continue its efforts to engage Rangoon. State Department spokesman Philip Crowley said the United States “understands and respects the decision” by Aung San Suu Kyi’s National League for Democracy, or NLD, to not to participate in elections that are expected to be held later this year. Crowley called the situation “regrettable.” He pointed to the military government’s unwillingness to open up the political process to key figures and various ethnic groups in Burma as the reason for the NLD’s decision to withdraw. “We think that that this is an opportunity lost in terms of Burma’s ability to demonstrate that it is willing to contemplate a different course of action, a different relationship with its own people and other groups within its own borders,” said Philip Crowley. The United States calls Burma’s election rules a “mockery” of the democratic process. Many other countries have criticized Rangoon’s election planning as deeply flawed and unfair. Crowley said the U.S. government will continue to reach out to Burmese leaders, despite Rangoon’s decision on the course of the elections. Burma’s election laws prohibit registered parties from having criminals in their ranks. The NLD’s leader, Aung San Suu Kyi, has been under detention for 14 of the last 20 years, and many of her party’s officials have been held as political prisoners. The election laws also require parties to swear allegiance to the 2008 Constitution, which guarantees the military a quarter of parliamentary seats regardless of election results. The NLD’s announcement on Monday to boycott the elections, came after more than 100 members of the party gathered at its Rangoon headquarters. Aung San Suu Kyi, who is under house arrest, had urged the NLD not to participate in the voting, saying that the election laws are unjust. David Steinberg, a Burma expert at Georgetown University here in Washington, says the NLD might split because of the decision it was forced to make. “The NLD was in a very very difficult position because either to participate means that they intentionally gave up their claim to legitimacy based upon the May 1990 elections, but to not to participate means that they are moved to the political periphery,” said David Steinberg. The National League for Democracy won Burma’s last elections in 1990, but the military refused to give up power. Burma’s government has yet to announce a date for the upcoming elections. Steinberg says he believes the military government is prepared to have opposition members in its new legislature. But he notes that those voices will not be able to control critical issues the country faces. Steinberg says the Burmese government needs the opposition to boost its credibility at home and abroad. According to Burma’s election rules, all political parties have until the first week of May to register. If they do not, they will be dissolved. YANGON, Myanmar — Many residents of Myanmar’s largest city Tuesday greeted a decision by the party of democracy icon Aung San Suu Kyi to boycott elections with rousing approval but others blamed it for leaving them with little choice in the military-organized balloting. In a bold gamble, the National League for Democracy on Monday decided to opt out of the country’s first election in two decades, following the lead of the detained Nobel Prize laureate who had earlier denounced the laws guiding the election as undemocratic. The decision, approved by an unanimous vote of the 113 executive members, spotlights the question of the polls’ credibility. The NLD won the most parliamentary seats in the last election in 1990, whose results the military refused to honor. “It is devastating that the NLD has chosen to boycott the election. Who should I vote for when the election comes?” said a 46-year-old university teacher Myint Myint Thein. But others approved of the decision. 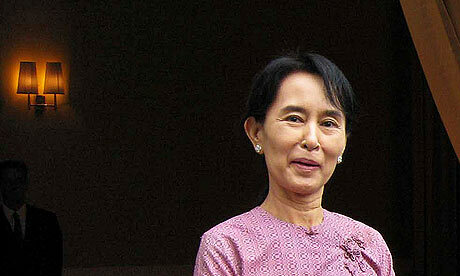 “(Suu Kyi) is our icon and our leader and she is the only person who can reflect the feelings of the public. We are with her and we support her decision,” said a 55-year-old nurse, Khin Zaw. The NLD earlier denounced the election laws, noting their provisions would bar Suu Kyi from participating, or even being a member of the party she helped found 22 years ago in the wake of a failed popular uprising against military rule. “We will continue to pursue, through peaceful means, democracy and human rights with support, understanding and assistance from the people, ethnic nationalities and democratic forces,” said party vice chairman Tin Oo. “The majority of the people will follow the decision because of their deep respect for (Suu Kyi), and the legitimacy and credibility of the elections will be thoroughly undermined,” said Thakin Chan Tun, a retired ambassador and veteran politician. The election date has yet to be announced, and the lineup of the contesting parties is still unclear. But it appears the military will field a party against a number of small ones, some of them pro-military. “I think the NLD has made a major blunder by not contesting in the election. We are all set to vote for NLD candidates and now we are left without any choice,” said Mie Mie, a jewelry shop owner. Cho Cho Kyaw Nyein, general-secretary of the recently formed Democratic Party, said the best way to serve the people and country was to get as many opposition seats as possible in the new parliament. The reaction of the international community, which has already expressed doubt over the fairness of the polls, could be crucial in determining whether the election will proceed smoothly. The junta hopes holding the vote will ease pressure for political reforms and accommodation with the country’s pro-democracy movement. At the same time, the party risks being further marginalized. 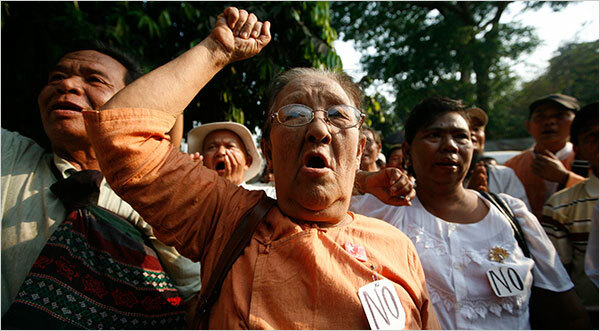 It has been the focal point for opposition to military rule, even though it has faced fierce repression. If it loses its status as a legal party, it may face tighter restrictions. U.S. State Department spokesman P.J. Crowley told reporters that U.S. officials “understand and respect” the NLD decision. “This is a reflection of the unwillingness of the government in Burma to take what we thought were the necessary steps to open up the political process and to engage in serious dialogue,” Crowley said. UNITED NATIONS, March 24 — Amid calls to refer the military government of Myanmar to the International Criminal Court, like Sudan was referred, UK Ambassador Mark Lyall Grant told the Press on Wednesday that his country would support such a referral. But, he said, the Security Council lacks the unanimity necessary for such a referral. Video here. Inner City Press asked China’s new Ambassador to the UN Li Baodong what his country thinks of the Council discussing Myanmar’s election laws. “General elections in a country is a matter of sovereign states,” he replied, “and should be respected.” This principle, he said, applies to Myanmar. Video here, from Minute 2:50. When Lyall Grant emerged to speak about Myanmar, or Burma, Inner City Press asked him about China position. We disagree, he said, noting that Myanmar is on the agenda of the Security Council, that it can instability that is a threat to international peace and security. But when Secretary General Ban Ki-moon addressed the media, Inner City Press asked him about Aung San Suu Kyi’s call on her National League for Democracy to not register for the upcoming elections, given how flawed the election laws are. 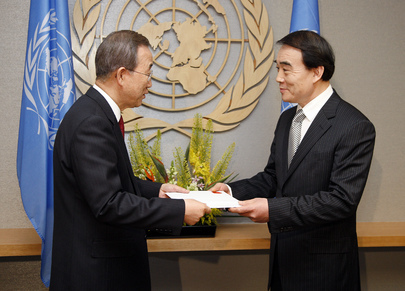 “Let me answer tomorrow afternoon,” Ban Ki-moon told Inner City Press. Video here from Minute 7:34, UN transcript below. There will be a meeting of Ban’s Group of Friends on Myanmar, to be addressed by Ban’s chief of staff Vijay Nambiar. We’ll be there. Footnotes: On March 23, Inner City Press asked Ban’s spokesman to confirm or deny that Ban proposed a former Indonesian foreign minister to replace Ibrahim Gambari as his envoy to Myanmar, but that Than Shwe vetoed it. Nesirky said, “that’s the first I hear of it,” despite the report being included in an article Nesirky said was the only story alleging that Nambiar secretly traveled to Myanmar earlier this year. Inner City Press asked the UK’s Lyall Grant if the UK believe that a permanent replaced for Gambari should be named. His reply noted that Nambiar is only in the position on an “interim” basis. As Inner City Press has previously reported, the U.S. has said it prefers not naming a permanent replacement until after the elections, so that the person is “not stained” by the elections. Inner City Press: I wanted to ask in the run-up to this meeting with the Group of Friends of Myanmar, Aung San Suu Kyi has said that her party, the NLD [National League for Democracy], and other opposition parties, shouldn’t even register for the poll, that the election laws are flawed. I’m wondering; you convened the meeting, what’s your thinking of what the UN can do, given that the main opponent now wants to boycott it? SG Ban: let me answer tomorrow afternoon after I have convened the meeting of the Group of Friends of Myanmar. I need to discuss this matter with the ambassadors participating in that meeting. I will have a clearer answer, if you excuse me. As London Calls for Myanmar Elections Meeting, UN Denies Nambiar Trip, His Replacement Vetoed? UNITED NATIONS, March 16, updated — Responding to the election laws proclaimed by Myanmar’s military government, excluding Aung San Suu Kyi and other political prisons from running for office, UK Prime Minister Gordon Brown said he has requested an emergency meeting at the UN in New York. But what kind of meeting? While one might expect the UK Mission to the UN to be able to, and to be eager to, explain a letter to the UN from Prime Minister Gordon Brown, further inquiry by Inner City Press indicates that Brown’s request is for a meeting of the Group of Friends of the Secretary General on Myanmar, which includes among others former Council member Indonesia. A former UN correspondent now in Washington reports that “the Burmese military junta is understood to have ‘vetoed’ the name of Noer Hassan Wirajuda, the former Indonesian foreign minister, as the new UN Envoy for Burma.” The UN has denied another portion of this report. 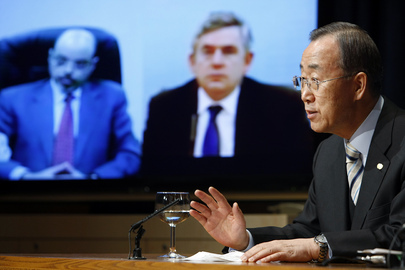 Update: at the conclusion of his March 16 press conference, Inner City Press asked Ban Ki-moon if he had received a letter from Gordon Brown requesting a meeting of his Group of Friends on Myanmar. There may soon be a meeting of the Group of Friends, Mr. Ban answered, but said twice that he has not received a letterfrom Gordon Brown. The UK-MFA press release quotes Gordon Brown that “I have today written to the UN Secretaty General to call for an urgent meeting in New York to discuss these developments.” So can the UK not deliver a letter? Inner City Press: did Vijay Nambiar travel to Myanmar? There are some reports that the letter described by the Secretary-General some time ago at his stakeout was in fact delivered by Mr. Nambiar. Can you confirm or deny that? Spokesperson Nesirky: Well, I have seen one report, not some reports. I’ve seen one report, and I have been in touch with Mr. Nambiar, and he says it’s not true. At a reception for the press corp in Nesirky’s office Monday evening, Mr. Ban and his deputy chief of staff Kim Won-soo appeared, but not Mr. Nambiar. And perhaps on the UK request, too. Just after 11 a.m., with the Security Council still meeting about the stage leaks Somalia Sanctions report, the UK’s Lyall Grant left the Council, deep in conversation with an aide about “the letter.” Did the UK Mission to the UN not get the memo? Finally, some note long standing reports that the UK is either dissatisfied with Mr. Nambiar’s performance or wants the chief of staff post it previously occupied via Mark Malloch Brown, or both. But, the reasoning goes, to move Nambiar out of the chef de cabinet post but keep him as (India’s) Under Secretary General, he would need the Myanmar envoy post. If it is being filled by another, how might this game of musical chairs end? Watch this site. Myanmar has refused the Philippines’ call to repeal the controversial election law that denies detained Opposition pro-democracy leader Aung San Suu Kyi participation in the election, expected to be held later this year. Myanmar’s defiance of calls by international community to rescind the controversial law was reflected Wednesday during a meeting between its Foreign Minister U Nyan Win and his Philippines counterpart Alberto Romulo on the sidelines of the Non-Aligned Movement’s meeting on interfaith dialogue in Manila. Romulo said Myanmar should live up to its commitment to institute political reforms in the country. He said he will urge his counterparts in the 10-member Association of Southeast Asian Nations (ASEAN) to press Myanmar to repeal the law during the ASEAN Foreign Ministers’ summit to be held in Vietnam’s capital, Hanoi, on April 8. But ASEAN has a standing policy of non-interference in each others’ internal affairs. Nyan Win evaded questions by reporters during the Manila conference. Myanmar’s military government published last week five long-awaited election laws it passed recently, setting the stage for polls it pledged to hold later this year. The authorities have already made it clear that the Nobel Peace laureate will not be allowed to take part in the polls, as she was married to a British academic. The Myanmarese constitution bans anyone married to a foreign national from holding political office. The new law tightens the clutches on Suu Kyi, preventing her from leading her own party or playing any role in election campaigning. The U.S. government has said it will continue to hold political dialogue with Myanmar’s military junta despite “regrettable” new election laws, but vowed that sanctions would remain in place. The State Department denounced the new laws, saying that it has made a mockery of the democratic process. Copyright © 2010 RTTNews.com, Inc. All rights reserved. This material may not be published, broadcast, rewritten or redistributed without prior written consent of RTTNews. President Obama took office hoping that constructive diplomacy could yield progress on some of the thorniest foreign-policy challenges facing the United States. 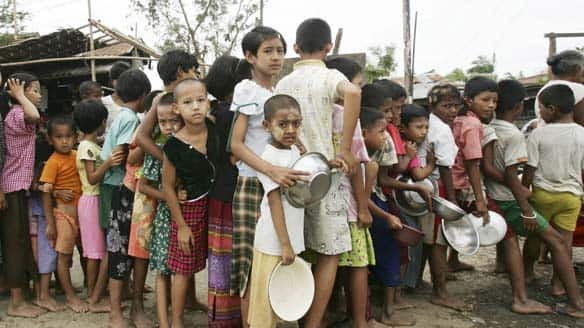 Among these was Burma, a Southeast Asian nation of 50 million people that has been misruled into poverty, decline and perpetual warfare by a benighted military dictatorship. Mr. Obama did not abandon economic sanctions against the regime, but he did hold out the prospect of warmer relations if Burma`s regime would show some sign of easing up on its people. This week the regime delivered its answer: Get lost. The government promulgated rules that make clear that an election planned for this year will be worse than meaningless. The new rules make it official: Burma`s leading democratic party and its leader, Nobel Peace Laureate Aung San Suu Kyi, will not be permitted to take part. Mr. Obama was right to offer, cautiously, an open hand. It has been spat upon. Now is the time for something new. When the people of Myanmar, formerly Burma, were last given a chance to vote 20 years ago they got it wrong and tried to oust the military regime which, in one guise or another, has ruled the southeast Asian country for more than 50 years. Within the next few months Burmese voters are going to be given another chance, and this time the generals are making absolutely certain that they get it right. The junta, led by Senior General Than Shwe, has already spent 12 years, starting in 1995, crafting a new constitution that ensures that whatever mischief voters may get up to when handed a ballot, the military will remain firmly in control. The coming elections may produce something that can be portrayed to Myanmar’s uncomfortable neighbours and an outraged international community as a civilian government. But it will be a sham with all the essential levers of power, the security and financial ministries, a bloc of seats in the parliament and the appointment of a president with the power to dismiss the whole lot of them firmly in the grip of the military. If that was not enough, the generals last week started releasing specific election laws and regulations which make it clear they are still scared witless by Aung San Suu Kyi, the detained opposition leader, and her National League for Democracy (NLD). Suu Kyi has been under various forms of imprisonment and detention for 15 of the last 21 years. She was already under detention when the NLD won about 85 per cent of the parliamentary seats in the 1990 election that the junta refused to recognize and has now legally annulled. As the widow of a foreigner Suu Kyi was already barred from running in the next election, but the generals are so frightened by the political authority of the woman they can only bring themselves to call “the lady,” and the affection in which she is held by the vast majority of Burmese, that they don’t even want her eligible to vote. One of the election laws published last week prohibits anyone convicted of a crime from not only voting, but also being a member of a political party. This disenfranchises Suu Kyi, and also hundreds of senior members of the NLD — including most of those elected in the junked 1990 elections — who have spent time in prison and who still make up the majority of the general’s 2,100 political prisoners. The NLD has been given 60 days to comply with the new regulations and re-apply for registration as a recognized political party. As of the end of last week, Suu Kyi and the NLD leadership had not decided what to do. They resolutely refused to take part in the 12-year-long nonsense of a “convention” to produce the new constitution. But until last week’s publication of the new election regulations they were seriously considering taking part in the elections on the grounds that it was a step, however feeble and flawed, towards a real civilian, accountable and representative government. But with the shattering of that thin and weak shaft of hope, it will be hard for the NLD to escape the conclusion that its participation will give unwarranted credibility to this electoral nonsense and whatever gerrymandered regime it produces. The junta’s brutish display of contempt for all the pressure, diplomatic and economic, that has been heaped on it over the years by both neighbours and the international community, including Canada, has produced both outrage and embarrassment. Europe, the Nordic countries, the U.S. and others have all dismissed the election laws and constitution as a mockery of a civilian political dispensation. At the same time a special United Nations envoy is due to deliver a report today recommending the regime be investigated for systematic crimes against humanity. Tomas Ojea Quintana says the junta has failed to end human rights abuses such as the conscription of child soldiers, slavery, discrimination against the Muslim Rohinga minority in northwestern Myanmar, and the deprivation of basic rights to food, shelter, health and education. ASEAN will feel especially embarrassed because when the organization defied international disapproval to bring in Myanmar as a member in 1997 it argued that “constructive engagement” would be more productive than sanctions and embargoes in changing the junta’s evil ways. 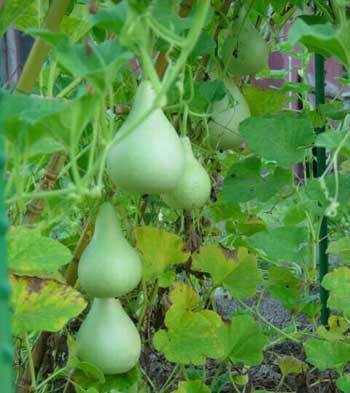 Most recently, even the new United States administration of President Barack Obama bought into this argument. His administration said that by moving away from Washington’s previous emphasis on isolating the regime, the generals would be encouraged to embrace democratic reform. “We want credible, democratic reform; a government that responds to the needs of the Burmese people; immediate, unconditional release of political prisoners, including Aung San Suu Kyi; serious dialogue with the opposition and minority ethnic groups,” Secretary of State Hillary Clinton said when the new approach was announced last September. Well, the generals have given their answer and it’s time to think again. Myanmar’s new election laws that prevent detained Opposition pro-democracy leader Aung San Suu Kyi any political affiliation in a party and ban from standing in election have provoked criticism from its neighbor the Philippines, as well as from the United States, the United Nations, and Britain. P J Crowley, spokesman for the U.S. State Department, said Myanmar’s military government had made a mockery of the democratic process. The laws banning any candidate with a court conviction deal a blow to the Obama administration’s policy of engagement with the military-run nation, he told reporters. The Political Parties Registration Law was one of five long-awaited election laws Myanmar’s military junta passed recently, setting the stage for polls it pledged to hold later this year. Crowley expressed doubt if the election will have credibility. He made it clear that “If Burma (Myanmar) is to advance, it is going to have to change its political process and make it more inclusive,” a term Washington uses for the participation of Suu Kyi and her party — the National League for Democracy – in the elections. It “doesn’t appear that Burma is prepared right now to open up its political process,” he added. The Philippines Thursday urged Myanmar to repeal the controversial election laws. “Unless they release Suu Kyi and allow her and her party to participate in elections, it’s a complete farce and therefore contrary to their road-map to democracy,” Philippines Foreign Secretary Alberto Romulo said. The Philippines and Myanmar are both members of the Association of South-East Asian Nations (ASEAN) which has often been criticized for failing to exert more pressure on Yangon to implement democratic reforms. The new laws, published Wednesday, prohibit anyone with a criminal conviction from belonging to a political party, which subsequently disables the person from contesting an election. Democracy icon Suu Kyi has been detained on various charges for most of the past 20 years after her political party, the National League for Democracy (NLD), won a landslide victory in the 1990 elections. NLD could not assume power, as the junta refused to recognize the election results. The authorities have already made it clear that the Nobel laureate will not be allowed to take part in the polls as she was married to a British academic. The Myanmarese constitution bars anyone married to a foreign national from holding political office. The new laws tighten the clutches on Suu Kyi, preventing her from leading her own party or playing any role in election campaigning.